Ed Rosenthal, the guru of ganja, the poster boy for medical marijuana and now "a triple felon, thanks to the Federal Government will be our guest. We will discuss his case as well as that of Angel Raich and Diane Monson that just declared the controlled substances act to be unconstitutional in regard to marijuana growers and users. UK Police Officer Who Introduced 'Softly Softly' Policy on Cannabis "The legalisation of drugs is a matter for politicians, not police officers. The issue for police officers is deciding what policing priorities should be, taking particular account of local views and resources. There is a need for reliable, credible and non-judgmental information to be more widely available, particularly to young people." Mayor Campbell has implemented "The Four Pillars Drug Strategy" as the City of Vancouver's policy and plan for reducing drug-related harms. The Pillars are: Harm Reduction, Prevention, Treatment and Enforcement. He has opened N. Americas first legal "shooting galleries" where addicts can avoid AIDS and learn to protect their health, from licensed medical personnel. Deborah Small of the Drug Policy Alliance will be our guest. She is the coordinator of the "Breaking the Chains" conference on racial bias to be held in Houston Texas on April 1 to April 3 of 2004. Dr. Earleywine is the author of "Understanding Marijuana, a New Look at the Scientific Evidence." With his in-depth, yet common sense approach to marijuana, Dr. Earleywine will enlighten us all. Jack spent many years as an undercover cop, busting nice folks like you and me. He now sees the utter futility of drug prohibition and tours the USA as director of Law Enforcement Against Prohibition. This is one show you don't want to miss. leap.cc. She became interested in Drug Policy when she wrote her senior paper on the administration of US drug laws and knew something was terribly wrong. She maintained her interest on the issues first in the '60's as the wife of a owner/pharmacist and then in the '70's as a guest talkmaster on WKAT's Talk of Miami. She is a member of Law Enforcement Against Prohibition, leap.cc. We will report on the Drug Policy Alliance Conference in New Jersey. We'll be sure to have lots of great interviews with reformers from around the world. Our guest Bruce Merkin will provide us with his analysis of the war on pot smokers. We'll discuss where we've been and where we're going in this decades long battle over the rights of sacramental, medical and recreational cannabis consumers. Our guest will be David Borden of We will hit the air live again on the Drug Truth Network, Tuesday, 10/28/03 at 7:30 to 8 PM, EDT, 6:30 to 7PM CDT and 4:30 to 5PM PDT. Likely topics will include government hypocrisy and shamanistic scientific practices. We will also hear a prerecorded clip from Michael Moore's Oct. 20th speech at San Francisco State regarding Rush Limbaugh's use of Oxycontin. Marijuana Everywhere! We look at the war on medical marijuana with guests: Rob Kampia, Ed Rosenthal, DA Terance Halinan and more. Cultural Baggage takes an in depth look at the insanity of the drug war, featuring the voices of several guests from around the world. For 10/7, we will get the chance to visit with the producer, writer and director of "Releaf", a movie short that examines the war on medical marijuana patients. Features the comedy of Woody Harrelson and Bill Maher discussing marijuana. Rick Doblin, PhD, is president of the Multidisciplinary Association for Psychedelic Studies and Publisher of their quarterly magazine. MAPS is a membership based organization working to assist psychedelic researchers around the world design, obtain governmental approval, fund, conduct and report on psychedelic research in humans. Is "X" good medicine for the bereaved... is peyote God's medicine? We'll ask the doctor. Marc just finished a tour of the 10 major cities of Canada, smoking pot in front of each police station. He was arrested 5 or 6 times even though judges have declared cannabis legal in Ontario and BC. As a pot seed seller, publisher, creator of Pot-TV.com and as a drug reform advocate, Marc is in a class of his own. Tune in to play this weeks, "Name that drug... by it's side effects." G.W. Pharmaceuticals has invented a new medicine, "Sativex", which uses the extract of whole cannabis plants. Dr. Guy is responsible for the rapid growth of this company. He estimates they have now grown more than 300,000 cannabis plants in making their medicines at up to 97% THC content. We'll follow up on the decades old "silent war" in Central and S. America that claims thousands of peasant farmers lives each year. Sure to excite the listener when Al outlines the policies used by the US government to perpetuate this other "war of terror." We'll kick the tires of the drug war with two veteran reform advocates. Matt is the long time computer guru of the Media Awareness Project. We'll discuss the impact of the internet on progress by the reform community, provide examples of ways we all can help to end prohibition and he and Philippe, (another guru,) will discuss the Vancouver Compassion Society, the Canadian marijuana laws and the heroin injection rooms in Vancouver. Sure to bring some amazing insights to the superstitious American listener. Sanho Tree of the Institute for Policy Studies in Washington D.C.
With his extensive experience in South and Central America, we will discuss with Sanho the decades long "silent war" that kills thousands of innocents each year in the seemingly eternal war on drugs. The Co-Founder of "Patients Out of Time" will discuss the use of cannabis by the 7 surviving patients who receive 300 joints each month from the US government and the fact that the American Nurses Association has now called for legitimizing the use of medical cannabis. One of the few US Representatives that stand for justice and individual rights, Ron Paul has shown himself to be a patriot of the highest order. We are sure to discuss medical marijuana, the appointment of the new drug czaress Karen Tandy and the mechanisms of Bush's war of terror. The man who first inundated the internet with the facts about the drug war. Cliff has a long term and unique perspective on this drug war. Join us as we discuss the history, the hysteria and the lies that gave us the first eternal war, the war on drugs. As head of America's preeminent drug reform organization, Ethan brings us a complete picture of the harms of this drug war and what solutions lie in store. This is certain to be a severe damning of the principles of the drug warriors and their hopelessly failed, $1 trillion dollar jihad on the peoples of these United States. Our guest was to have been US Congressman Ron Paul, but he was called to debate the medical marijuana bill before congress at the same hour. The bill was lost to a mostly Republican majority, but in a breath taking show of support, 152 US Congressmen voted this date to end the war on medical marijuana. Host Dean Becker took listener questions re medical use, the police jihad and more. We will discuss the federal governments mandatory minimum sentencing, the travails at the US border and the ongoing efforts to pass a federal medical marijuana bill. As the defense attorney for the bulk of the Tulia residents arrested by the word of the now discredited narcotics task force officer Tom Coleman, Jeff Blackburn nobly defended and eventually freed the 39 black residents that were imprisoned by this sting. We'll also hear an Indepndence day message from Steve Kubby who now resides in Canada, a UN certified refugee from the US drug prohibition laws. Eric Sterling, President of the Criminal Justice Policy Foundation. A criminal justice system that is honest, fair and effective is one of America's most important institutions. The Criminal Justice Policy Foundation is a private, non-profit educational organization that promotes solutions to the problems facing the criminal justice system. Ed Rosenthal the Guru of Ganja will co-host, to pitch for the KPFT, Houston Pacifica station Pledge Drive. Us and Them will sing anti-war songs by Pink Floyd. We will work together to bring down the walls of drug prohibition. Judge James P. Gray, author: "Why Our Drug Laws Have Failed, and what We can Do About It - A Judicial Indictment of the War on Drugs." Judge Gray is also considering a run for the Presidency under the Libertarian Banner. He has also stated that the US Attorney General, John Ashcroft is the most dangerous man in America. Sullum writes about a wide range of issues, including drug policy, gun control, censorship, privacy, education, and religious freedom. We will discuss the need for drug treatment, what is use, abuse and addiction. We will discuss what would happen in a world where drugs are legal. Listen to a brief pre-show interview. Debbie Jefferies, Author of "Jefferey's Journey"
We discuss her 8 year-old sons use of medical marijuana for treatment of his mental illness. Also includes interviews with Dr. Joe McNamara and Eric Sterling. 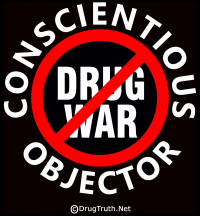 We explore the question, "Is the US drug war a continuing criminal enterprise?" NORML Conference in San Francisco. More interviews from the NORML conference in San Francisco & our special guests San Francisco District Attorney Terence Hallinan and Dr. Thomas J. O'Connell. NORML Conference in San Francisco. Dozens of reformers from around the world will discuss marijuana and overall drug reform methods. Guests include: Jack Herrer, Ed Rosenthal, Dr. Tom Oconnel, Mike Gray, Chris Conrad, Mikki Norris, Elvy Musika, Shawn Heller, Valerie Corral, Keith Stroup, Ron Crickenberger, Richard Lake, Allen St. Pierre, Dr. Ethan Russo, Richard Cowan, Senator Nolin, Richard Ostander, Jackie Rickert, Steff Sherrer, Cliff Shaffer, Jay Bergstrom, Ben Mazel, Lynn & Judy Osborne. Roger Goodman, Exec. Director of the Voluntary Committee of Lawyers in King County Bar Association in Washington State. We will discuss the drug war and the lack of morals on the side of the drug warrriors. Nora Callahan will also join us for a brief visit. Learn more about the Easter Music and Cannabis Odyssey. Mike Gray, author of "Drug Crazy - How We Got into This Mess & How We Can Get Out," editor of "Busted: Stone Cowboys, Narco-Lords and Washington's War on Drugs," Chairman, Common Sense for Drug Policy ;script writer; producer and director. Howard Wooldridge, retired police officer with 15 years experience. Now a lobbyist in Austin for Texas Drug Laws. President of Texas NORML and a member of LEAP, Law Enforcement Against Prohibition. Howard just returned from the first International Drug Conference in Merida Mexico. Tune in, it should be a great show! Cele Castillo, 12 year DEA Agent, now retired, Cele Castillo will discuss human rights violations, corruption and his experiences in S. America, C. America, Mexico and New York. He is author of the great book "Powderburns"
Host Dean Becker and >strong>Buford Terrell, Professor of law at South Texas College of Law interview noted author and activist Ed Rosenthal abouthis ongoing federal trial for growing medical marijuana. Recently acquitted of growing cannabis for medical marijuana patients in Canada, head of the Canadian Marijuana Party.